Discussion in 'Spidey-World' started by Venom_uk, Jul 25, 2004. 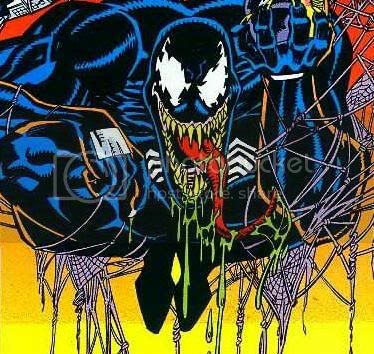 This thread is for all the Venom fans out there, & I know theres a lot of you, to share cool Venom pics, quotes & anything else us fellow 'Venomites' might like. I'll get us started with this pic of Venom from the front cover of #1, from the current running Venom series. Also, this classic of Venom standing over a prone Spidey from ASM#316 by Todd Mcfarlane. Great pics! I LOVE Venom, I just don't know if I want to see the movies turn THAT dark yet. I also want them to cast a GOOD Eddie Brock. I agree ShadyKitty, when they decide to use Venom in a Spider-man movie (my moneys on either 5 or 6), they need to make sure they pick the right guy as Eddie Brock. The Venom side of things will probably be handled with CGI anyway so that's ok, but the Eddie side of things they need to get spot on. The last one is Venom 2099 for anyone that doesnt know. I love that 'Venom: Licence To Kill' cover. Great stuff. Nice pic of a Bagley drawen Venom to if I'm not mistaken. He does a brilliant Venom IMO. That pic of Venom from 2099 looks well strange! Not sure if I like that or not. Looks good apart from the face. You mean this Henry Rollins? Well he's deffinatly got Brock's physique, but having never seen him acting I'll take your word that he'd be good enough to play Eddie. p.s. He is an actor right Vapor? He's got the physique, the look plus he is already interested in the character so that's a bonus. Cool. Deffinatly a bonus that he's interested in the character. Like I said before, he's got the look (minus the tattoo's of course) but whether or not his acting is any good is the question. Any body seen him in anything & if so, is he any good? He's got the voice too IMO... going by similarity to the EB from the 90's Spidey cartoon. I don't think Venom would be too dark a villain for the Spidey movies, actually... the concept and theme is definitely dark, but it could be kept from falling into being too depressing by keeping Venom's traditional sense of humor from the comics. On another vein, here's some McFarlane Venom. Nice. I loved the voice acting from the 90's cartoon. Eddie/Venom was really well done IMO. Came out with some great one-liners to from what I remeber. I agree with you there Dr.Dude. 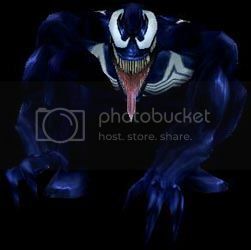 If Venom was to ever be in a Spider-man movie, his houmour from the comics would DEFFINATLY have to be transffered across to the big screen. 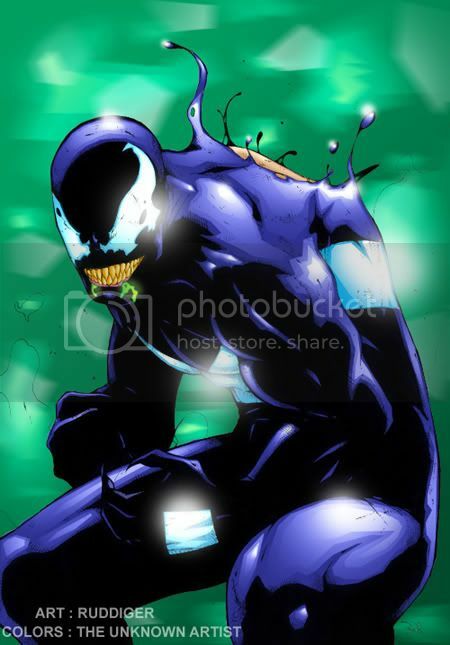 Thats one of the things I love baout Venom, he's evil but funny at the same time. I think we'll have Lizard in S-M3, although that might be abit to obvious. 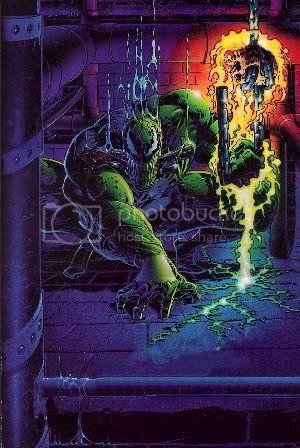 Green Goblin 2 (Harry) will make an apperance also I think. Thats why I think Venom will appear in either 5 or 6. Chances are by then we'll have a whole new creative team & cast by then anyway. I've heard someone say else where that Raimi is doing a 'Goblin saga' with the 1st three movies. Whats from saying we wont have a 'Venom/symbiote saga' in movies 4-6? That would be awesome. S-M5 = John Jameson brings back alien symbiote from space. We see spidey in black suit for most of the move before he realises it's trying to take over him, then we have the usual seperation in church then the movie could end with the symbiote bonding with Eddie. p.s. They really asked Molina back? Cool, but I can't see how that would work though! Why? Theres no proof hes dead.He simply vanished. Come on, he was sinking to the bottom of the river, plus the lights on his tenticles went out. Also the vacant look on his face as he was going down kinda gave the impression he was a gonner. Just my opinion, but I wouldn't mind seeing him back in another Spidey movie. A Sinister 6 story would be awesome. He could be stunned,or dazed.But if Molina was asked to return by Raimi then I'm happy.The way Ock went down he could easily be brought back in a million different ways. And hes notorious for repairing his damaged tentacles.Making them deadlier than before. But on the subject of your thread............I'd like to see Venom appear in a movie.I'm not sure I'm keen on a saga of it though. Ok, maybe a saga such as what Raimi's doing at the moment with the Green Goblin might be abit much for Venom. But I think they would have to use at least two movies to get a decent story out of it. I really don't think a Venom story could be told in a single movie. Unless it was about 5 hours long that is! I see your point about Doc Ock too, in the world of comics (& movies for that matter) anything is possible! Yep. Exactly. Gotta have Spidey in the black costume for abit. Black Spidey rules. We havn't had a Venom pic for awhile, so heres one i just found flouting around. Enjoy.